What does ________________ mean in ski speak? What is a snow snake? What is a yard sale? What is a face shot? Who is a park rat? In many popular pursuits, a lingo or slang is often developed to help define its culture and for like minded people to understand each other. Skiing & snowboarding is no exception! Over the years, a skiing & snowboarding language has evolved and continues to expand with each new generation of skiers & riders. Here are just a few of the common terms you might hear on your USA snow holiday. Try putting these into practice on your next American ski holiday or test your family & friends to see how much they would understand! Those pesky, invisible snow monsters that grab your skis in the middle of a run and cause havoc for your previously beautiful line. Usually results in some sort of small crash or embarrassing, out-of-nowhere leg wobble. See: yard sale. When a skier crashes and their gear scatters across the hill: poles, probably a glove, usually both skis, hopefully not a helmet. Please, stop and help this person out of their embarrassment and into either their gear or safety. ​​​​​The dramatic action when a skier or snowboarder loses control and crashes in a cartwheel tumble, turning head over heels down the mountain side. A pretty un-poetic and graceless fall. Powder, the glorious white fluffy snow that cold, dry nights often bring. An overnight Christmas miracle met with cries of joy, early morning departures, and too much coffee. Also used in the phrase: fresh tracks. 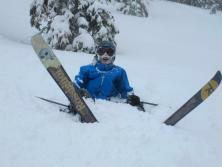 This is the glorious time when you are the first to ski a run and your tracks are the first and only in the new powder. Many wake up at unimaginable times of the morning to obtain these medallions of glory. Frequently associated with face shots. Cutting through fresh snow before anyone else does, leaving behind your trail for all else to see. If achieved expect a smile from ear to ear but remember to quickly take a picture! When the new snow is so light, delicious, and fluffy that it sprays up into your face every time you make a turn. Frequently, this type of snow will make it the best ski day of your life. A person who is a very skilled skier and bombs their lines flawlessly. Generally a beautiful sight to witness. Someone who spends the majority of their resort time in the terrain park, jibbing (riding) rails and tackling jumps. Often a rival of the lovers of backcountry or in-resort powder skiing. The gloriously kind people who run the lifts from open till close and help with all the caught tips, stuck poles, and general disarray surrounding loading and unloading the lifts. Thank them when you get the chance. ​​​​​​​Someone who has discovered the best alternative to working. Commonly someone who is new to skiing and unknowingly makes it clear with wardrobe selections and various mannerisms at the base area. Gaper gap refers to the inch or two of exposed and chilly forehead between the bottom of the helmet and those ten-year old pair of goggles. To be remedied by pushing the two back into unison, for style and also for a significantly warmer face. American term for skiing with skis parallel to one another; the opposite of pizza. The day’s over – time for drinks. Think dancing on tables, listening to live music, all whilst swapping war stories from the slopes. We hope you enjoy learning the lingo and practising it with the locals whenever you can.